So today I thought I would show every WIP – work in progress that is top of the pile. Or the stuff I jump back and forth between. I like having several projects on the go at once, some are for when I watch TV, some are for quiet by myself time, some need more focus/light so I only get to work on them occasionally. 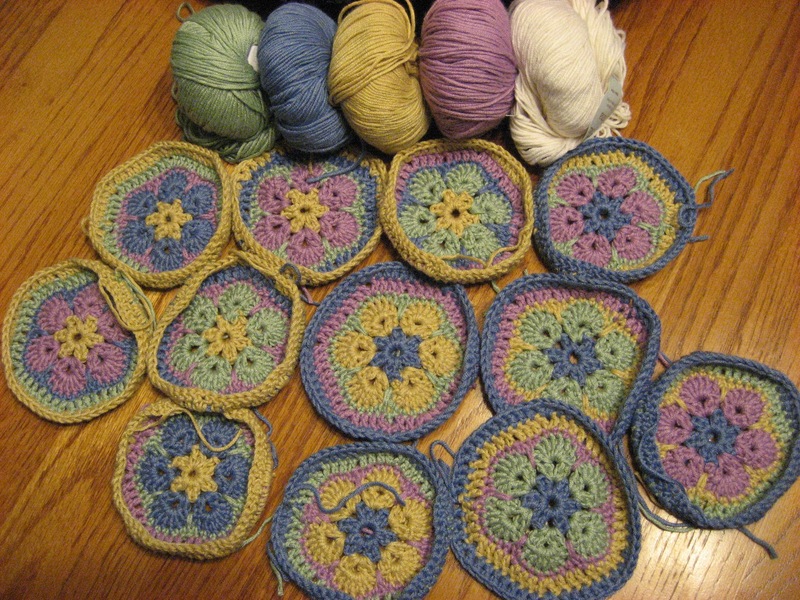 This is my African Flower afghan. There are lots of African flower examples all over crochet sites. I loved that it was an easy motif to do and I thought the soft colours worked well for a flower. I found a huge deal on some Debbie Bliss Prima 80% Bamboo 20% Merino. It is lovely to work with and very soft. The motifs will be variants of the four colours and I will attach them and add an edge with the off white. 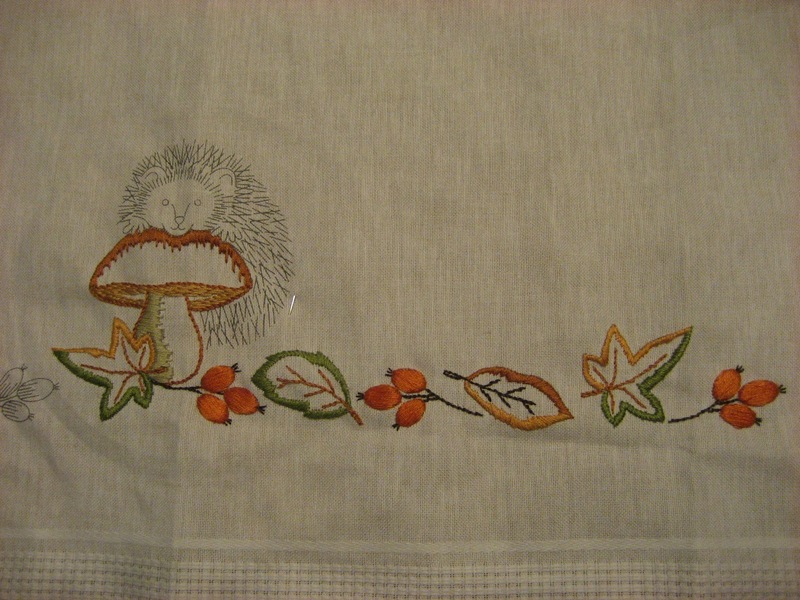 This is my Rico hedgehog table-cloth kit. I ordered it from England and was pleasantly surprised that it was not too expensive with shipping and the exchange. 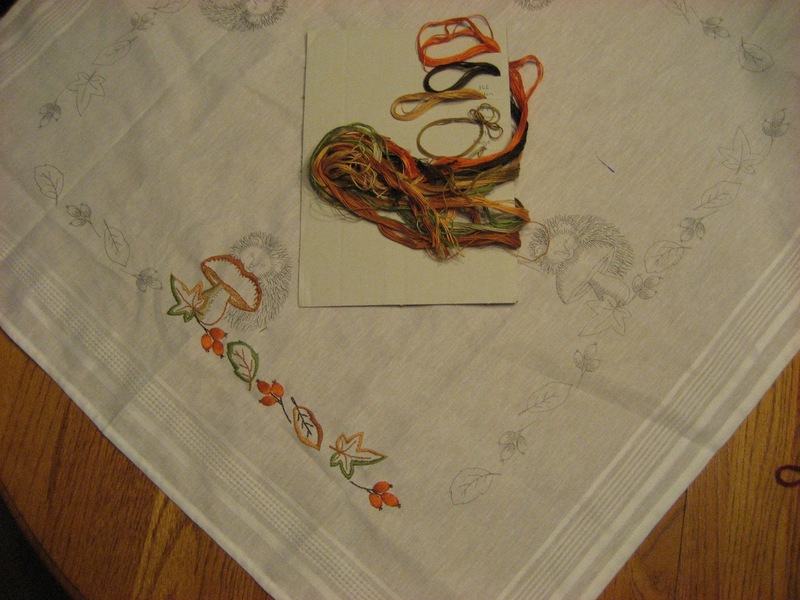 I need really good light to work on embroidery anymore so it is a slow project. 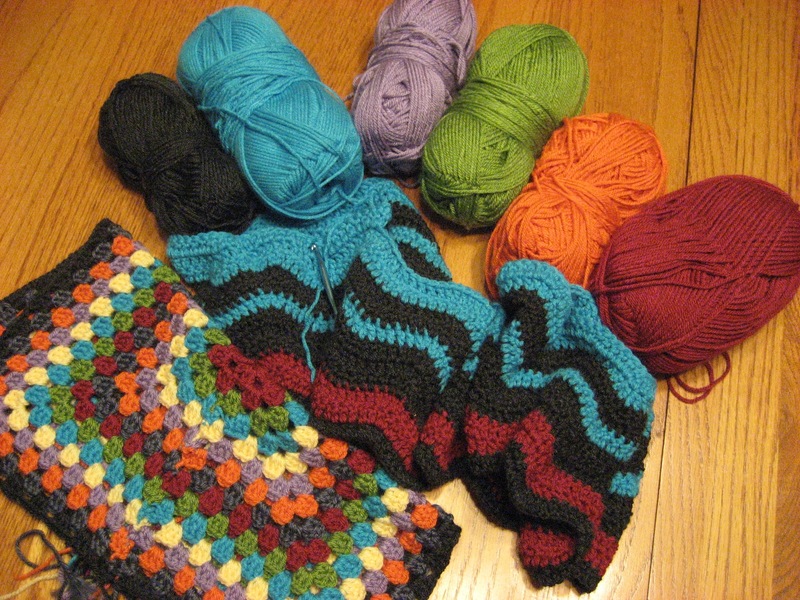 I have wanted to make a ripple afghan for a long time and I am using the leftovers from Miss Murfins Christmas present. I have not decided about the denim blue (it is a different yarn and I don’t like it as well) and the yellow. I may decide to add them in later. Right now the turquoise is overwhelming the other colours, I think that will fade as it gets bigger and more colourful. 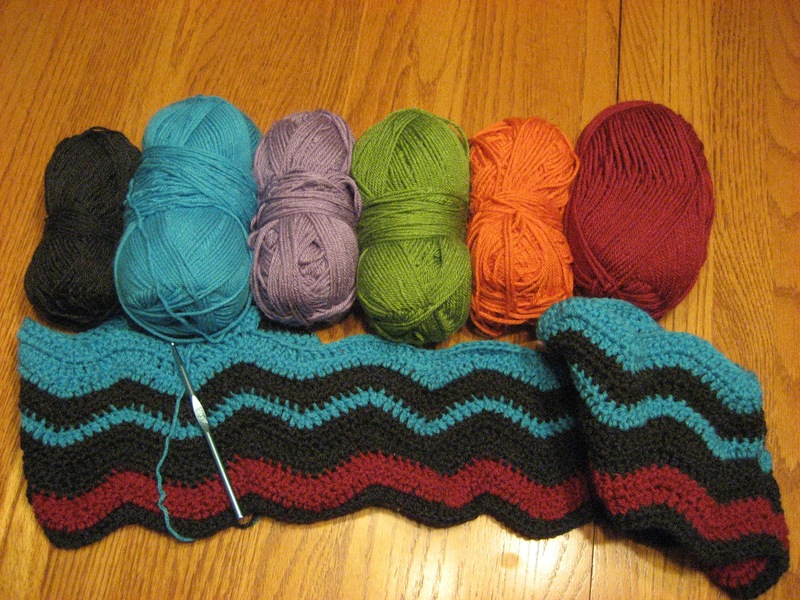 I am following the stripe combination designed by Lucy at Attic 24. 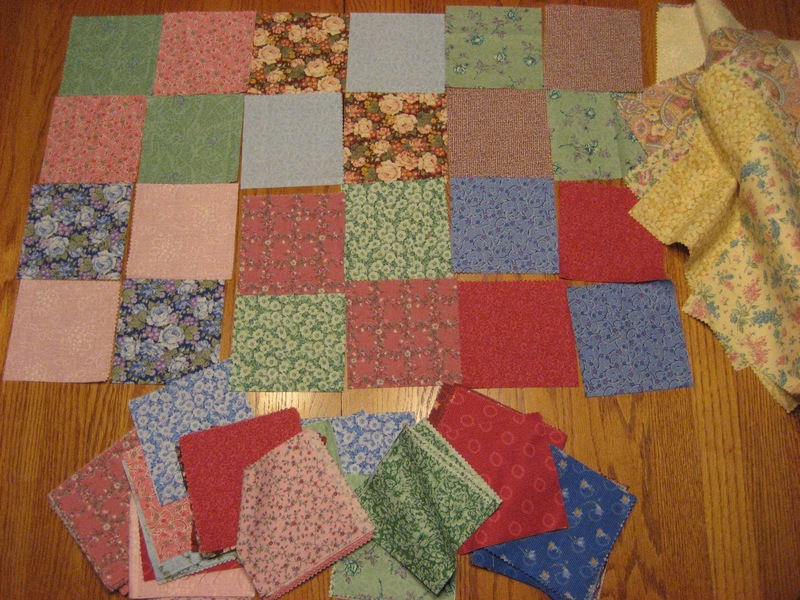 And my vintage colours quilt. On hold as my sewing room is still in the process of moving. But I did get to play with colour combinations. I am still thinking 4 patch of 2 colours, but part of me just wants to do it random. I also think I need to add the yellow pieces sitting on the side. 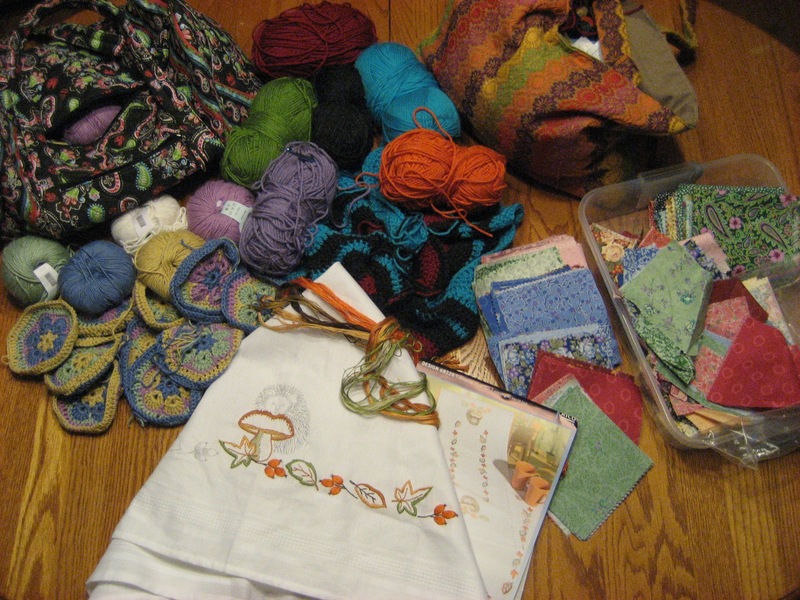 That is all of my crafty projects that I have on the go, but there are a lot waiting in the wings. I hope as soon as we are totally moved in to Hedgehog Hill to get going on a whole bunch of new Projects, including some big painting/refurbing projects, and finish these of course. Not that I would add a few more to this list….